Weddings are one of the most extravagant and emotional parties you got to attend (and experienced), and we know how stressful it is for both the couples, including the people that are involved in the whole wedding preparation. But few weeks ago, we stumbled a modern and chic wedding, the millennial way. 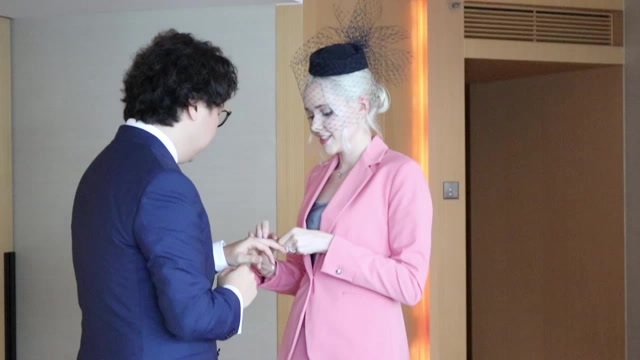 Meet Taylor – Canadian vlogger/model based in Hong Kong who recently got married to his Hong Kong based husband in a most stylish, chic and stress-free wedding ceremony. 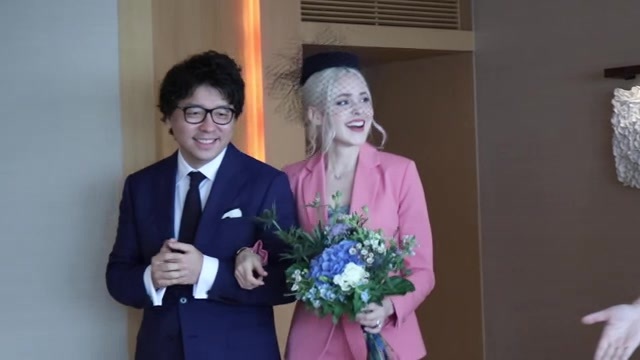 She revealed that she decided to wear this gorgeous bride in pink ZARA suit (yes you read that right!) 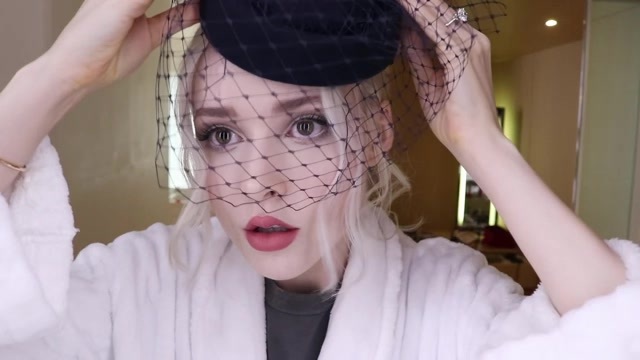 topped with a black pill-box headdress, she shared on her vlog that her wedding outfit was inspired by the icons Bianca Jagger, Audrey Hepburn, Jackie Kennedy, and Carrie Bradshaw. The civil wedding ceremony was held in one of the hotels in Hong Kong overlooking the gorgeous view. This is the most millennial and thrifty way to get married in-style of course overlooking the perfect view of Hong Kong harbour. The gorgeous bride and her prince, ooohhh so sweet! The intimate affair was only attended by their close friends, including the civil wedding officiate. And since Taylor’s family are couldn’t make it on her wedding day, they did what the modern bride should do. Using Skype video calls, her family have witnessed the sweetest and coolest wedding ceremony ever! Isn’t that awesome! You can also watch her vlog below where she explains why they did this practical wedding ceremony. What can you say about her wedding? Will you opt the extravagant wedding or the practical and coolest wedding like Taylor’s? We would love to know your thoughts below! Adorable and beautiful! Love this unique wedding! And practical! NO need to spend lots of money for the ceremony. This is not only emotional but lovely too. I have never heard of this vlogger but she is lovely. Yeah she isn't one of the mainstream vloggers and I like her videos! I agree. Classic and stylish plus affordable fashion! I think the husband's suit is more expensive. Carrie Bradshaw is such an icon If I am lucky to get married, I will do the same. That's an amazing thing to do. Hands on bride but gosh, that would have been very stressful. I agree. They know each other well, and kudos for the bride for choosing a simple yet very emotional ceremony. She looks absolutely gorgeous. Planing end executing weddings can be extremely stressful. So glad she was able to do it stress free. She is truly an amazing lady who knows what she wants, and give stress to the husband! That's true! I also like that Bradshaw simple wedding - I find it more intimate and sacred. That pink suit is everything! You guys are adorable. I wish I had kept things even simpler for my wedding. Thank you for visiting Candace! I love this so much! She looks absolutely stunning, and I think it's great they did it their way. Good for them, and I wish them all the best! That is true! 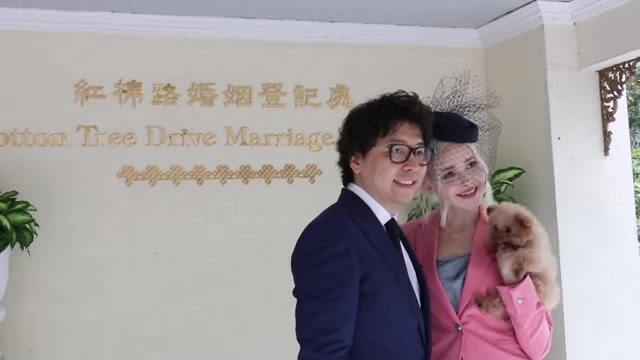 Considering her husband is a Chinese and Hong Kong-based and if they will follow the traditional Chinese wedding, it will be so grand and stressful. I admire their decision to have a cool and practical wedding. I see more and more non-traditional weddings lately. It's great when a couple makes a memorable moment even more memorable. She is my hero! Amen for many thrifty brides like her. Love this simple and non traditional wedding instead of taking risk or life threatening moment. 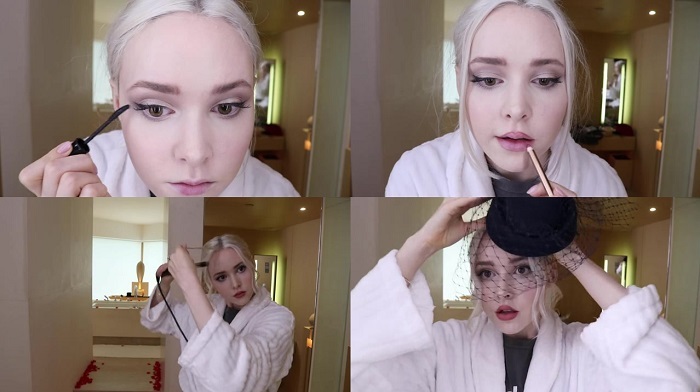 BTW, the woman looks like Dove Cameron whom I seen on Agents of SHIELD. She looks amazing. I love this simplicity. Bride looks gorgeous in this outfit. What a cool wedding! I'm am all about weddings like this. I prefer smaller ones without all the fuss. I agree. This way makes more intimate and memorable. What a cute and non-conventional way to do a wedding! P.S. I couldn't love that adorable little dog any more! Yeah her pet is totally adorable. I think its name is Rosey. Such a unique outfit for a wedding. It is her day and she can wear what she wants. I still like the white dresses. Yeah, I thought she will wear those wear dresses she had shared before, and I was surprised she decided to wear this pink suit. But still I like her idea! Very different from a traditional wedding but very pretty nevertheless. That is true! I bet the husband is s happy for not spending thousands of dollars for the wedding. Oh wow, I absolutely love her outfit! I am living for that birdcage! They are both practical and rather spend on travels. She is so gorgeous! I love this! Her suit is beautiful! I was married in a civil ceremony like this one as well. Having a big wedding was never my dream, and I don't regret not having one for a moment. I like a simple civil wedding - I think it is more intimate, then have a vacation tour! 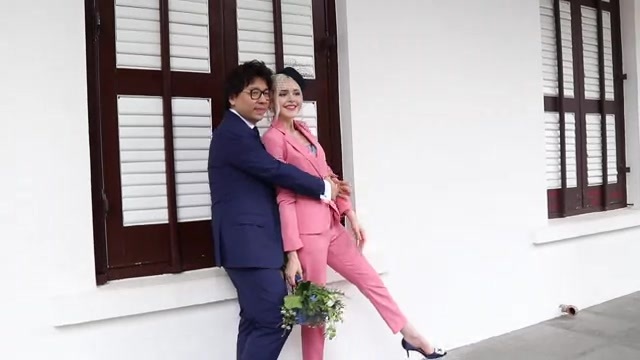 I love the fact that she got married in a pink suit. What a brave woman! I know right! But look great on her - it is her personality! So adorable and you look gorgeous. Definitely worth not spending thousands - you don't want to spend 5 years paying for your wedding day! Doing your wedding your way is the most important thing. In reality, it's one day out of your life, and while it's important, it's what comes after that one special day that matters more. That is true, plus if I will do the same wedding I wouldn't give troubles to my friends and family. Fuss-free wedding! Not really my style but still cool. I think spending money on an amazing honey would be way more worth it then a wedding. I agree with you! I would love to splurge for vacations than a huge wedding. Such a precious wedding! I love the pink! Thank you Jessy! She is adorable! She looks amazing! I love that she did something a little untraditional for her bridal look. The pink suit is a great choice. And the guests attended through Skype! Aw this is cute. She looks good. And she looks so in love. It doesn't matter what you wear on the day. It's always the life after. Yeah and I find her wedding so emotional, geez she got what I am wishing too! That is true. Living in Hong Kong is already expensive, so no wonder she will opt for a most affordable wedding. Weddings talaga are one of the things we ladies have dreamed eversince we were young and been planning since then... im so happy for her she got the wedding of her dreams!!! That is true! But I prefer a simple wedding like hers but in the highest rooftop in Thailand! Follow her, she is adorable and genuine vlogger! Mine are both practical and we don't like fussiness in every events. I love love love this outfit!! The had is also stunning!! This wedding is really cool and affordable! Would link my friends about this. 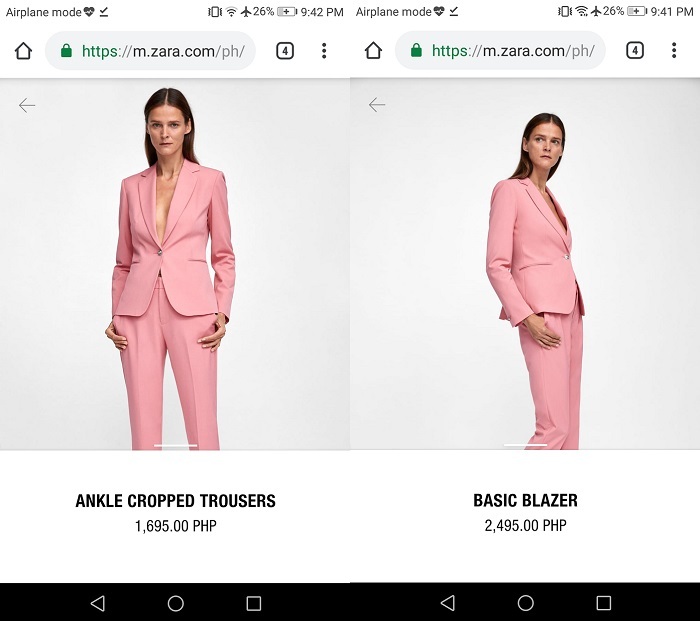 Who wouldn't know you can get married wearing ZARA?! It's certainly unconventional. But it's lovely! I like people who go out of the box and set something new and radical. Wow, you just can't guess what lovers are up to nowadays. My take on this - super cool, amazing but still an emotional wedding because it's still a union of two people wanting to be together! Future brides could take a leaf off this bride's book. Why go through the stress and the shenanigans when you can have an equally beautiful wedding sans the hoopla. I won't be surprise if this will soon be a trend. That's true! Also it is becoming a trend here in many parts of Asia, particularly in China and Hong Kong to make celebrations as simple as possible. It is the way to be discreet, especially if you have lots of assets to protect. She looks flawless and happy! Weddings are about celebration your way. It looks like she achieved that! I agree, she did it fabulously, and they are both happy with their decision. I'll do the same.